I’ve had a mixed relationship with the Lego-based movies. The Lego Movie was, as the song suggested, awesome. The Lego Batman Movie was fun. The Lego Ninjago Movie was possibly a step too far, so would The Lego Movie 2 bring the series back to where it all began. Well, after a slow start, I can say that everything is still awesome. Five years after the events of the first film and the residents of Brickberg are under attack from The Duplo aliens, turning the city into a wasteland now known as Apocalypseberg. While everyone lives a violent, Mad Max-style lifestyle, Emmet is still upbeat and optimistic. When his friends are kidnapped by a mysterious alien from another world, it’s up to Emmet to become the hero and save them, with a little help from macho Rex Dangervest. What made the first film such a joyful surprise was that it fired gags faster than a speeding bullet. It had more jokes in its first five minutes than most films had in their full running time. Nervously, this time around the gags seemed to be somewhat thin on the ground at the beginning as we get a reminder of days gone by and we are introduced to the new threat awaiting the returning characters, Emmet, Lucy, Batman and the gang. Even when we jump five years later, the gags are there (a neat nod to the world of Mad Max), but they aren’t flying out as fast as before. Is this the end of the line for the Lego Movies? I need not have worried. With Phil Lord and Chris Miller back on script duty, the random humour, surreal gags and self-referencing jokefest soon hits its stride and away we go. In a film that is certainly aimed at a younger audience, it’s incredible how many adult-orientated jokes are played out. We get digs at the DC universe (a favourite for these films, this time with comments about Christian Bale and Michael Keaton…” he was great in Beetlejuice”), Bruce Willis pops up al la Die Hard, and even Supreme Court judge Ruth Bader Ginsberg makes an appearance. As before the events played out in the Lego world are controlled by humans. This time, it’s all to do with the brother and sister relationship when dad (Will Ferrell in a cameo role) gives permission for her to play with his beloved bricks. We know this is the gimmick of the film, and so we do get to see the human world more often than before, but that doesn’t distract from the craziness played out in Lego. 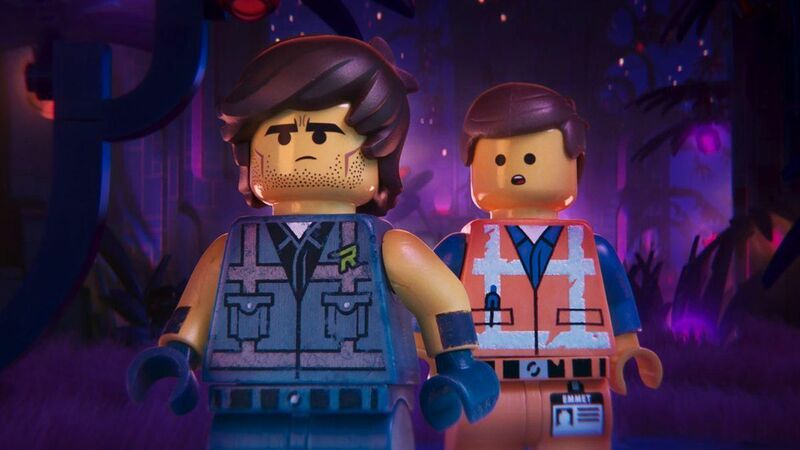 New characters add to the fun, including Emmet’s new friend, the rugged Rex Dangervest, with stubble, ruffled hair and the voice of Kurt Russell, although it’s an impression from Emmet’s human voice, Chris Pratt. Songs, this time, play much more of an essential part of the film. Everything Is Awesome is back but not in the way we remember but we are joined by a host of new numbers that almost turn it into a musical. Queen Watevra Wa-Nabi (a shape-shifting multicoloured Duplo creation voiced by Tiffany Haddish) who wants to marry Batman (Will Arnett) can’t seem to carry a conversation without it turning into an all-singing number. Be warned: Catchy Song, a new song, will be with you long after the film has finished, and not in a good way. Stick around for the credit song, performed by Beck, of all people, and why you should stay to read who made the film. 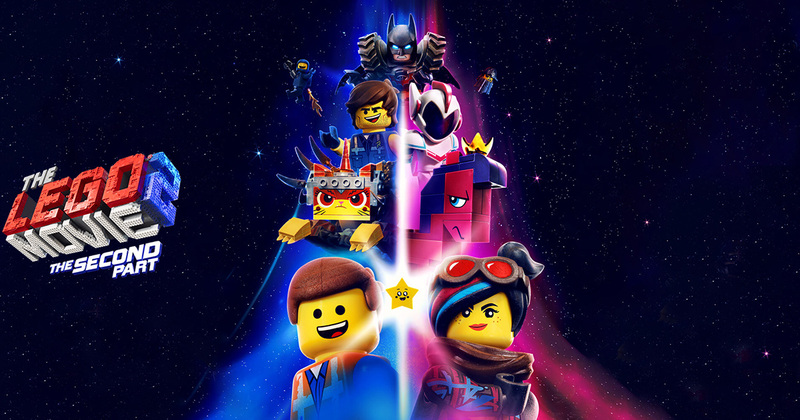 The Lego Movie 2 is a blast. It may take its time to really get going, but once it finds its footing, it’s just as bizarre, just as bonkers, just as funny as the first film. Kids will love the bright colours and speed of the action, but adults will get most of the jokes and have just as much fun as their young companions. Seriously, will kids get a joke about Radiohead? I think not. Yes, everything is still awesome and then some.